Thomas Harrison R McClean was born the only son of John R B McClean and Emily McClean. Thomas was born in Dungannon, County Tyrone about 1898. His father was a farmer. Thomas McClean enlisted in Dungannon. Private Thomas McClean was serving with the 1st Battalion of the Royal Inniskilling Fusiliers when he was injured. He died of wounds in France on 1st April 1917. He was 19 years old. Thomas Harrison R McClean was born the only son of John R B McClean and Emily McClean. Thomas was born in Dungannon, County Tyrone about 1898. The 1901 census lists Thomas H R as age 3 living with the family at house 15 in Mullaghateige, Drumaspil, Tyrone. His father was a farmer. Family: John R B McClean, Emily M McClean, Francis F McClean (born about 1894), Thomas H R McClean (born about 1898). Thomas McClean enlisted in Dungannon. Private Thomas McClean was serving with the 1st Battalion of the Royal Inniskilling Fusiliers when he was injured. Private Thomas McClean died of wounds in France on 2nd April 1917. He was 19 years old. 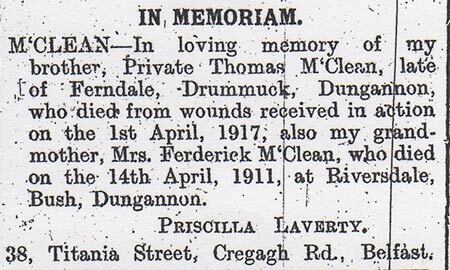 Private Thomas McClean, Royal Inniskilling Fusiliers, Drummuck, Dungannon, wounded. 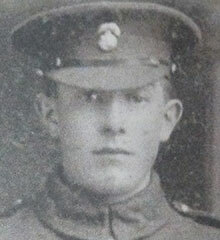 Private Thomas McClean, Royal Inniskilling Fusiliers, Drummuck, Dungannon, died from wounds. He was a grandson of the late Mr John Patchell, J.P., a former manager of the Dungannon branch of the Provincial Bank of Ireland. 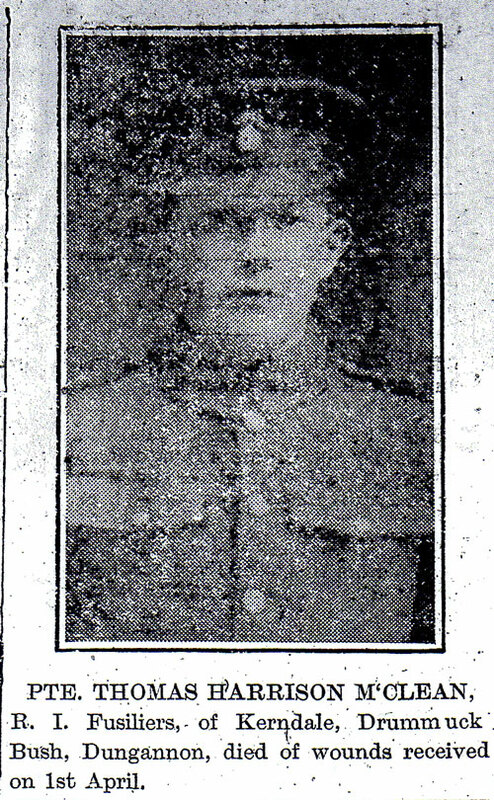 Private Thomas Harrison McClean, Royal Inniskilling Fusiliers, of Kerndale, Drummuck, Bush, Dungannon, died of wounds received on 1st April 1917. In the event of my death, I give the whole of my property and effects to Mr J R B McClean, father, of Drummuck, Dungannon, Ireland. Thomas McClean, 27448 Private. 3 Royal Inniskilling Fusiliers. 29th December 1916. Private Thomas McClean is buried in Foreste Communal Cemetery, which was used by the 92nd Field Ambulance in April 1917 and later by the 61st (South Midland) Division. 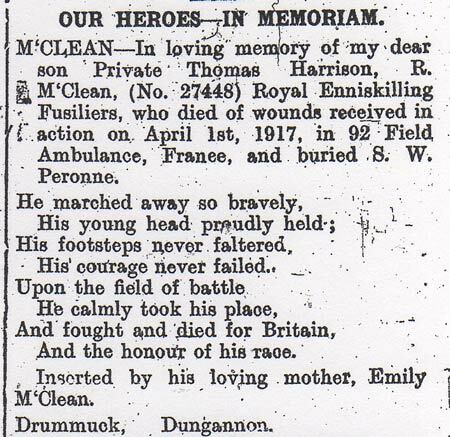 McClean – In loving memory of my brother, Private Thomas McClean, late of Ferndale, Drummuck, Dungannon, who died from wounds received in action on 1st April 1917, also my grandmother, Mrs Frederick McClean, who died on 14th April 1911 at Riversdale, Bush, Dungannon. Priscilla Laverty. 38 Titania Street, Cregagh Road, Belfast. 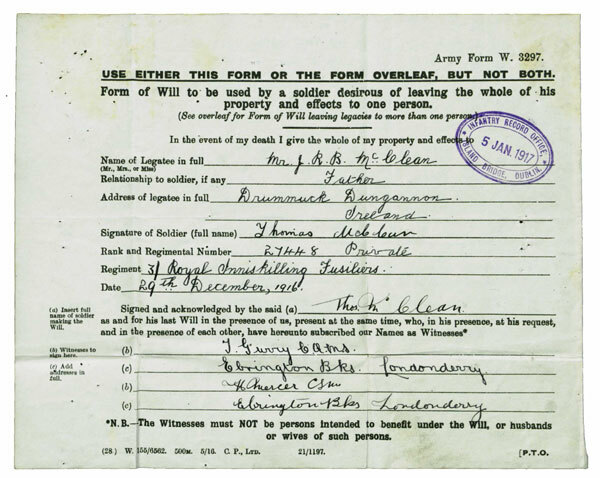 McClean – In loving memory of my dear son Private Thomas Harrison R McClean, (No. 27448) Royal Inniskilling Fusiliers, who died of wounds, received in action on 1st April 1917, in 92 Field Ambulance, France and buried S. W. Peronne. His young head proudly held. He calmly took his place. Inserted by his loving mother, Emily McClean, Drummuck, Dungannon. 5 War Graves Photographic Project Photo of Thomas McClean's headstone can be purchased here.